Vintage “Grand Mesa Resort” COLORADO Nature and livestock animal Theme. Rare Postcard Set 1cent. Condition is Used. Shipped with USPS First Class Package. Cards are new but old may have a few blemishes or small bends. 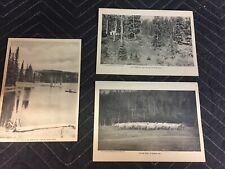 Lot of 3 beautiful Colorado postcards. came from an extensive postcard collection Several other 4 card sets Available from the grand Mesa delta area. Vintage “Grand Mesa Resort” COLORADO Map car road Theme. 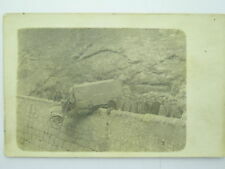 Rare Postcard Set 1cent. Condition is Used. Shipped with USPS First Class Package. Cards are new but old may have a few blemishes or small bends. Lot of 4 beautiful Colorado postcards. came from an extensive postcard collection Several other 4 card sets Available from the grand Mesa delta area. Vintage “Grand Mesa Resort” COLORADO River and Camp Theme. Rare Postcard Set 1cent. Condition is Used. Shipped with USPS First Class Package. Cards are new but old may have a few blemishes or small bends. Lot of 4 beautiful Colorado postcards. came from an extensive postcard collection Several other 4 card sets Available from the grand Mesa delta area. A stunning 24x36inch (60x91cm approx) photo poster of Vivien Leigh. Very Good / Very Good Condition. Lot Of 7 RPPC Some Actors B & W Early 1900’s Unposted Condition is Used. Shipped with USPS First Class Package. 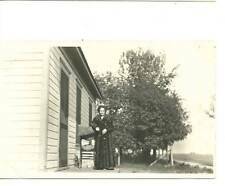 Lot Of 6 RPPC Real Photo Postcards B&W Women Men Brides Unposted Condition is Used. Some with writing Shipped with USPS First Class Package. Lot Of 6 RPPC Real Photo Postcards All Children one with a grouping same child as previous photo B&W Condition is Used. One is postmarked Shipped with USPS First Class Package. Ian Ziering - ORIGINAL Black and White 8x10 Celebrity headshot photo in great condition. Headshot Condition: The headshot should be in good condition. The digital image you see here is intentionally inferior to the original headshot. LUCIEN MURATORE (MARATOR), FRENCH OPERA TENOR. Main Street Buffalo New York Real Photo Post Card Rrpc. In good condition with some wear and staining as pictured. Pictures the works area. Back is unused. Card is in very good condition. and is based on representation of item. RPPC Real Photo Postcards Lot Of 6 Men And Women Early 1900’s one is marked written 1907 Condition is Used. Shipped with USPS First Class Package. Lot Of 7 RPPC Real Photo Postcards Infants And Children Unposted Condition is Used. Shipped with USPS First Class Package. I'm guessing this is from about 1910. Rhyolite is a ghost town in Nye County, in the U.S. state of Nevada. It is in the Bullfrog Hills, about 120 miles northwest of Las Vegas, near the eastern edge of Death Valley. During an ensuing gold rush, thousands of gold-seekers, developers, miners and service providers flocked to the Bullfrog Mining District. RHYOLITE, NEVADA. BOTTLE HOUSE. FRASHER. RPPC. UNUSED. Published by Frasher’s Inc., Pomona, California. There is a slight crease in the top right corner. 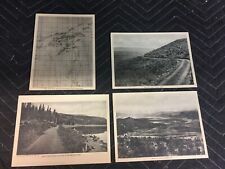 Lot Of 6 RPPC Real Photo Postcards B & W Early 1900’s Some With PM Some with writing. The one on the top left has a tear Shipped with USPS First Class Package. "Established by President Calvin Coolidge on December 9, 1924, to preserve Citadel and Wupatki pueblos. This photo reads," Carl Olson on Rimrock. - Pendleton Roundup '48". The collector I bought this photo from wrote the price he paid for it in Pencil on the back. Photo may have a few bent areas and/or edges, or yellowing from age. 1910 RPPC Shaker Room in Weaving House, Wiggins Old Tavern Hotel Northampton, MA Dimensions: 3-1/2 x 5-1/2 I always combine shipping on multiple purchases, please visit my ebay store "wiztekworld" where you will find over 1000 ephemera items and collectibles. Thank you!. 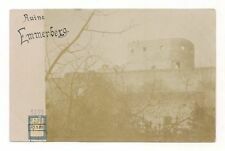 USED/UNUSED - Unused with CYKO stamp box ( 1904 - 1920s ). CONDITION - 2 on wear but the card is wavy. Still displays very nicely. 4 --- VERY GOOD - Wear on the corners, edges and surface of the card. Blonde flapper, very 1920's. A very pretty Hungarian woman. great bus photo! -various nationalities in bus. This is an 8 x 10 glossy photo in perfect condition. Many of these images I shot during my career as a press photographer. This photo is a BABY JANE EXCLUSIVE! Available ONLY right HERE! RPPC IN VERY GOOD CONDITION.